The fence project is finally complete. 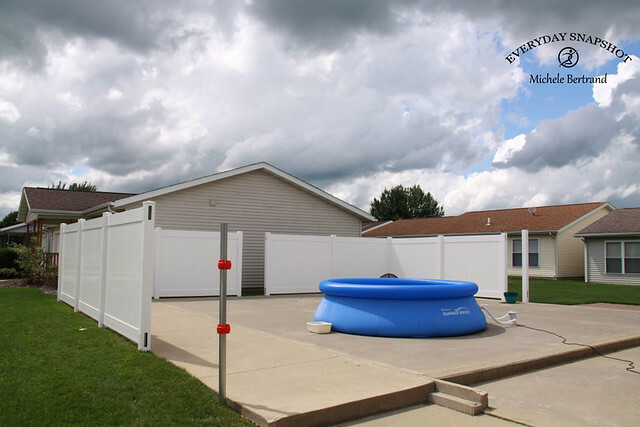 We put up a vinyl privacy fence on the extra lot we have. We plan on getting a bigger pool next year, and we’ll then be required to have it all gated off. 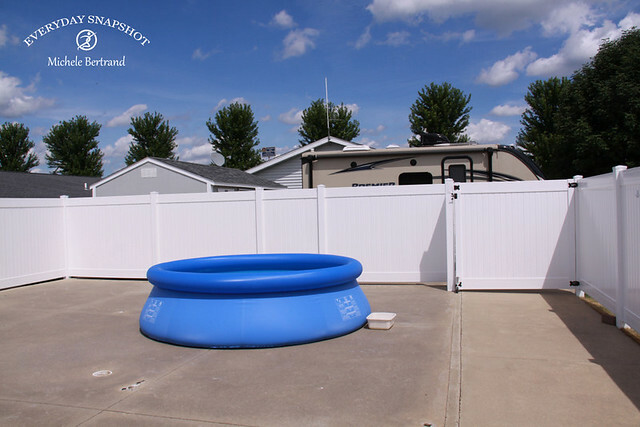 So fence this year, new pool next spring. 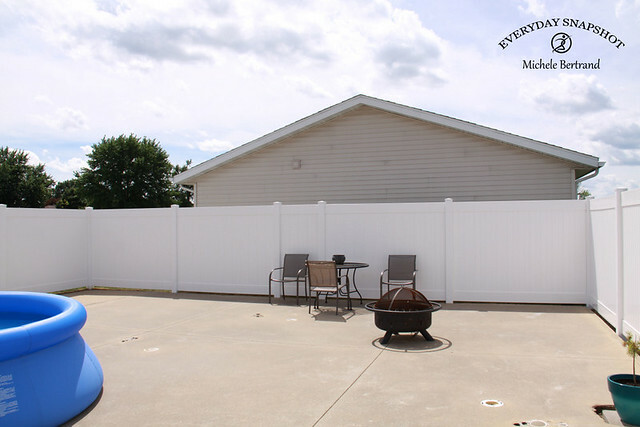 We put up a 6’x8′ Richmond Vinyl Privacy Fence. 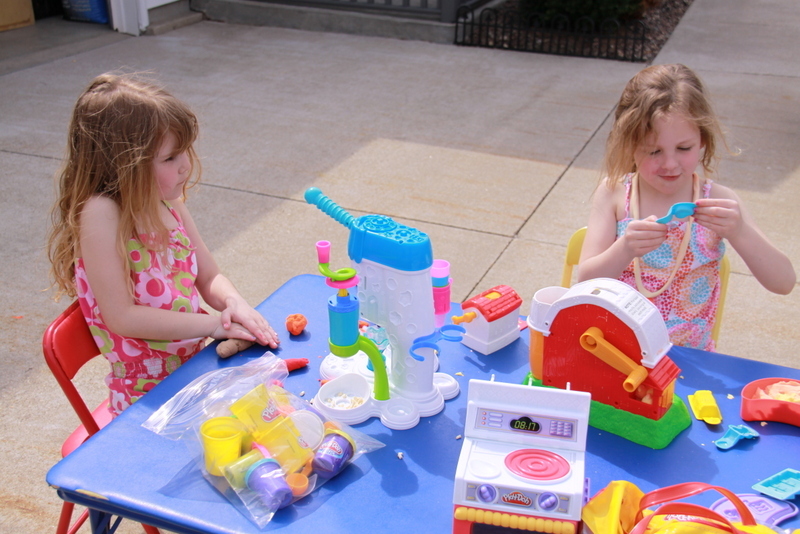 It was a kit that we put together. It’s also a snap/lock in without brackets and hardware. 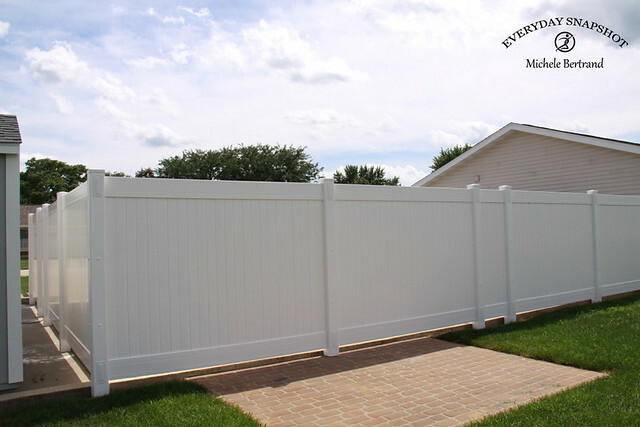 One of the biggest feature’s of this fence is the Post Leveling Collars that we used and bought from a company in Canada. 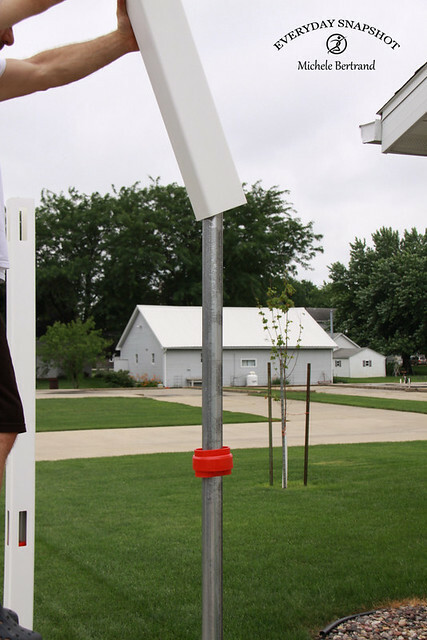 If you are a fence company looking to give these awesome time saving post collars a try, contact Direct Fencing Supply out of Martensville, Saskatchewan in Canada. Tell them I sent you of course. Super nice people to work with. 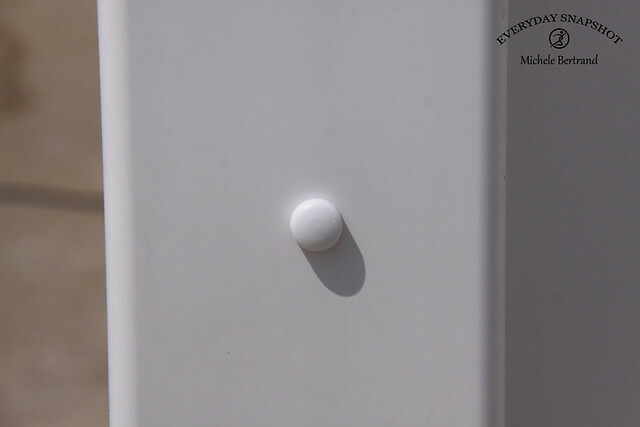 If you are a consumer looking to use these and do it yourself as we did, still contact Direct Fencing Supply and they can help you find the supplier closest to you. So what’s the big deal about these red donuts? 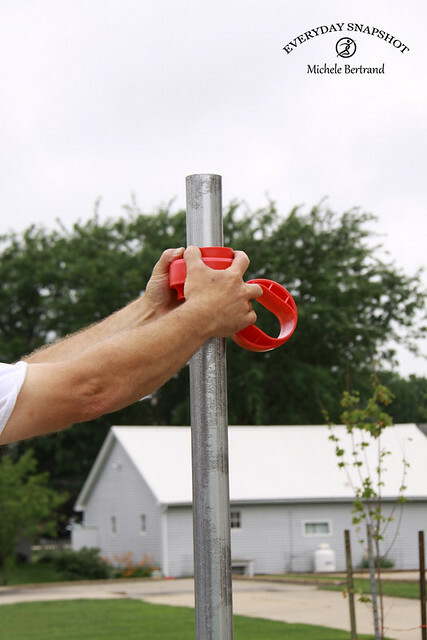 Well, post leveling collars are the best post-to-pipe pole leveling accessory on the market, allowing you to install your steel posts without digging a hole or using concrete. The collars are round on the outside, with an oblong hole in the center. 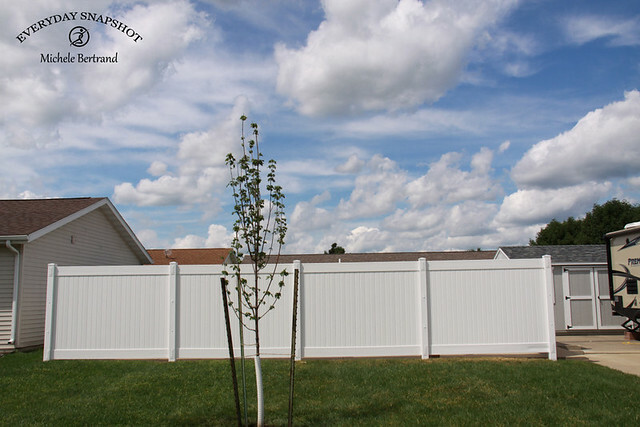 They help you build a straighter fence in less time. We can now verify, they absolutely do ! 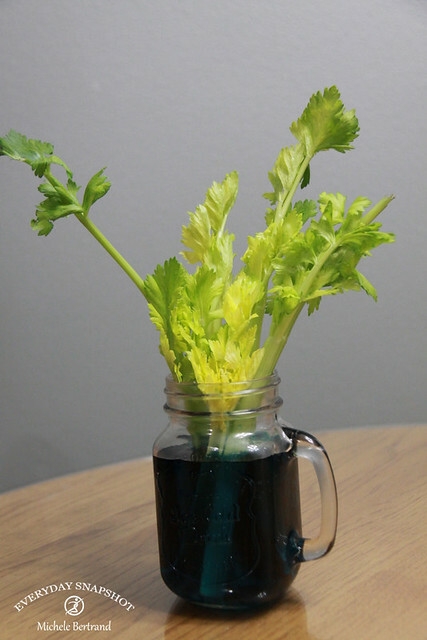 No need for an auger or concrete mixer. 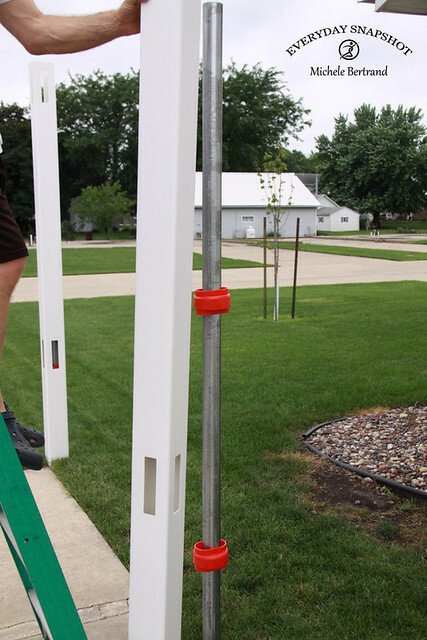 You will also save money on vinyl because the PVC post length stays above grade, so a 6′ fence requires only a 6′ post. They are using these in Canada more than the USA at the moment, so they have been proven to withstand some of the harshest climates and most difficult soil conditions. We were so excited to receive our box and get started on this fairly new way of getting a fence up quicker, easier and having it be more easily adjustable and durable. You’ll need just 2 pieces. The post leveling collar (aka donut) and the top rail post. After you drive your galvanized steel post in the ground and level it best you can, slide a few collars on. You can adjust these by turning and sliding. They fit snug so they stay put no problem. 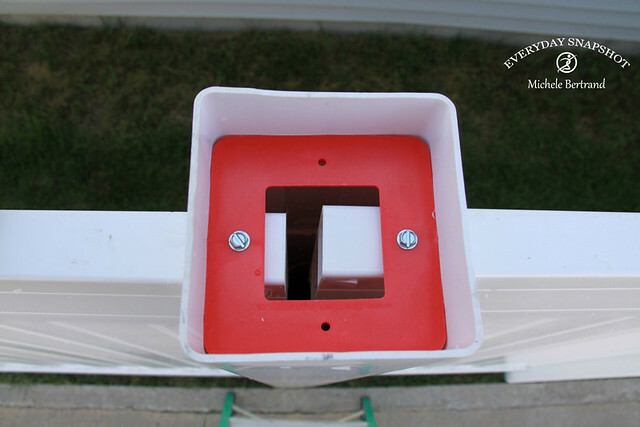 Slide your vinyl post over, check for level and see if you need to make any collar adjustments. 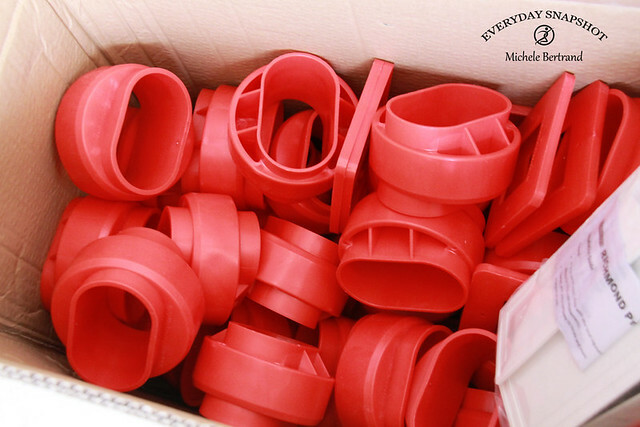 The post leveling collars also allow you to make quick adjustments until you feel it’s perfect and ready. When you’ve got it, you are ready to move on. Then we were on a roll and each section and panel went pretty quickly. We had just one side that the fence was going in the concrete. 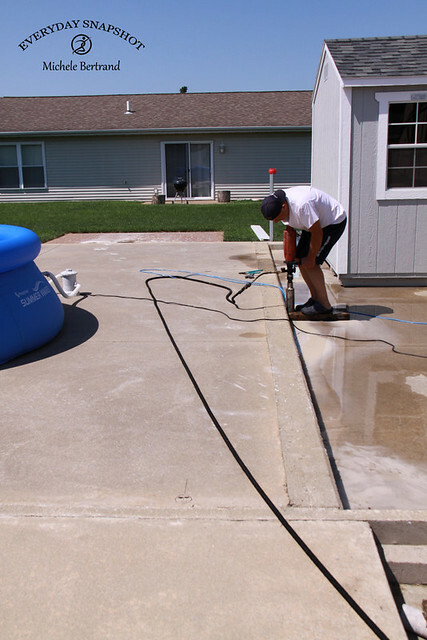 Had we realized a concrete drill made this task such a breeze, we’d have probably put the whole thing in the concrete. But since 3 sides were already done, we just kept going as is. 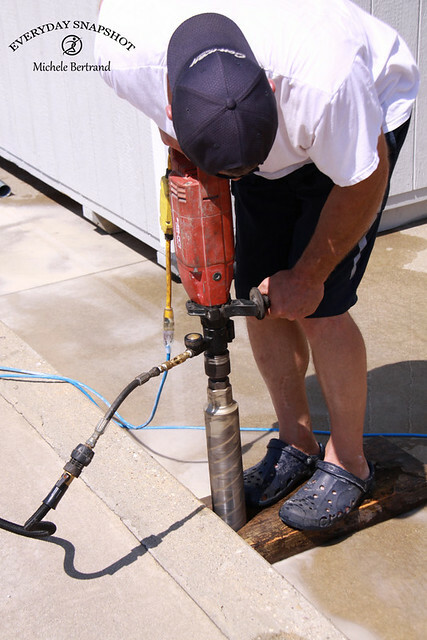 Renting a concrete drill if you don’t have one made life easier than we imagined. Received a little tip to make a cut out in a block of wood the same size as the bit. That way it doesn’t jump all over until you get the hole going. Worked like a charm, so wanted to mention it in case it should help anyone else. Cut through like butter and we were done with each hole in minutes. Only thing with this side was we had to make darn sure we measured right. 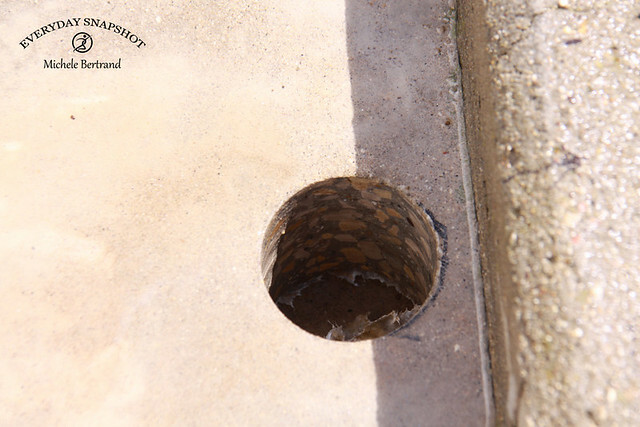 When drilling concrete there’s not much room for error like driving the post in to the ground on the other 3 sides. We could redo if needed. Thankfully, we had no oops’s. 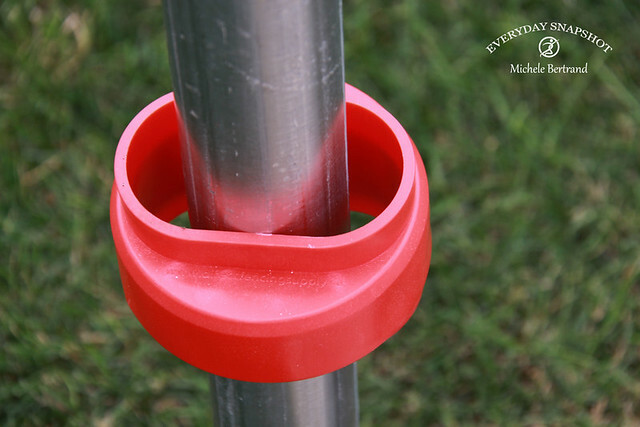 So you’ve pounded your steel posts, leveled up your vinyl post on your adjustable collars. You then snap in your bottom rail. Slide in the tongue and groove panels. Snap in your top rail. It should fit very tight, therefore eliminating hardware. When you are done and everything is perfectly level. You will use the top rail ties. So you can see how far the top rail snaps in to the vinyl post. Even though it’s snapped into place and isn’t going anywhere, this top rail tie secures it all. That way there is absolutely no sliding from the top rail. Here’s a view of the corner. Works the same way. Then place your post cap on. One last little step. 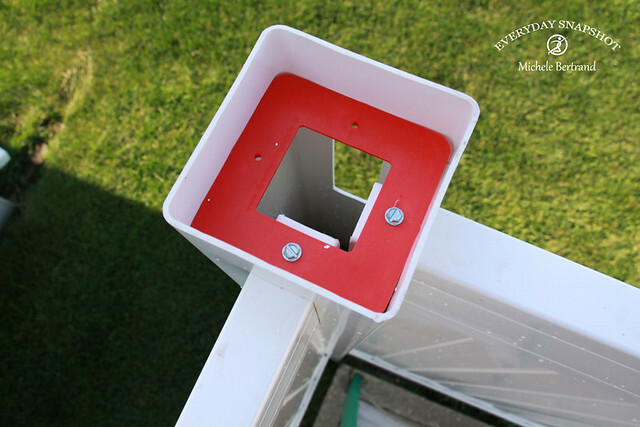 Set a screw through the vinyl post into the post collar for added security. Place a button on and done. A few shots of the finished results from the inside. One reason I love this fence, is it’s the same on the inside and outside, no front and back, no good side bad side. This cement slab was intended for another house to be built on it. 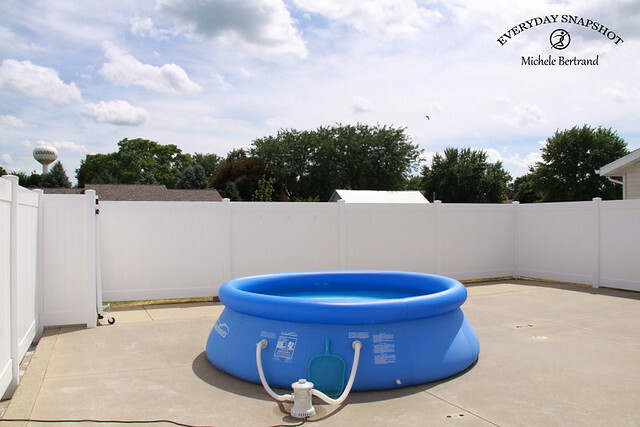 We bought it with our house and will be using this instead for our pool, fire-pit, lounging and hang out area. It worked out to have 4 full panels per side, and a little bit. We chose to put the short section in the middle. It’s just a personal preference. The gate is almost done. We have one more little bracket to get. 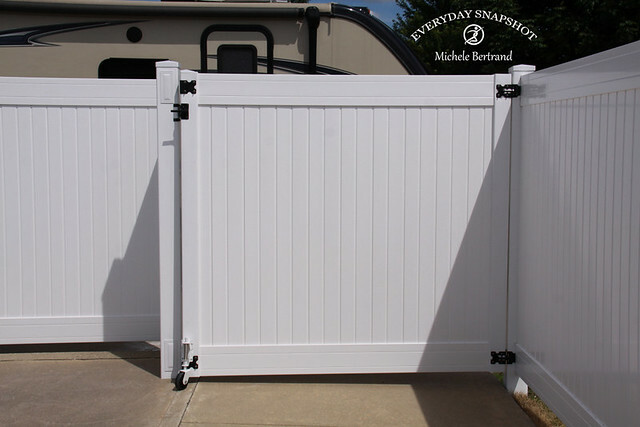 Since the gate is bigger and on a slope, we used this Stainless Steel Swivel Gate Wheel to prevent sagging and to make opening and closing smooth. It’s spring loaded for rough uneven surfaces. It rolls really nice. Highly recommend if you need one. Finished exterior. We put the gate up over the step like this to prevent tripping on that step. 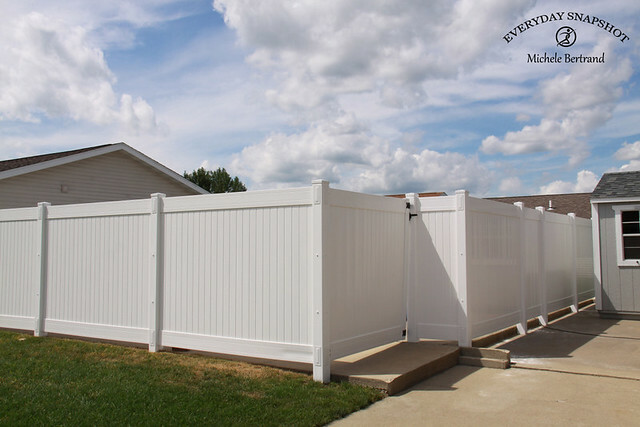 These collars and this particular fence kit made the installation go really good. 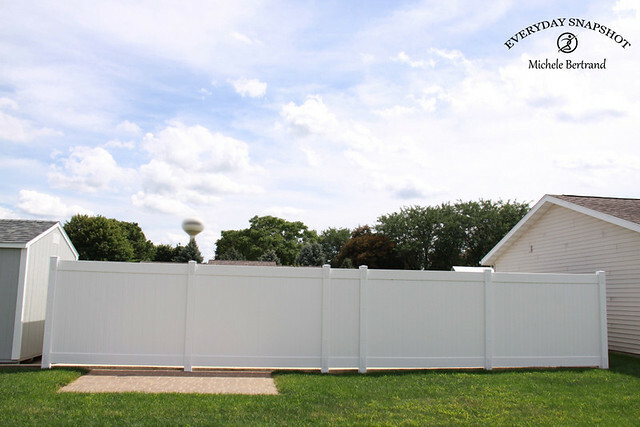 This is the first fence we have ever put up and we fully expected many problems and were surprised how smoothly things went. 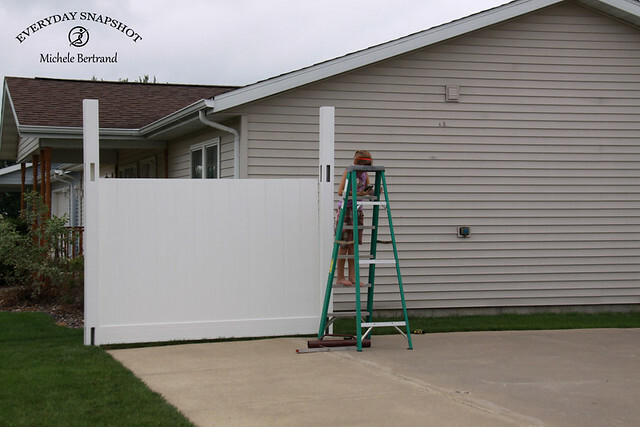 Direct Fencing Supply also has a fantastic installation video on their website that covers this whole process really good. We are extremely happy that we went this route. 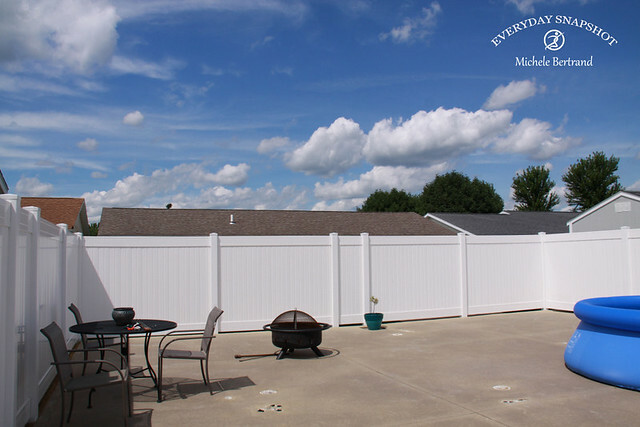 Not only did it make life easier, but we couldn’t be more pleased with the way our fence turned out. 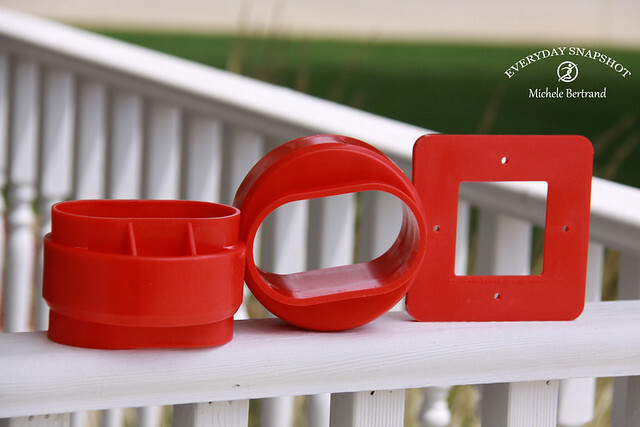 Thanks for the review on our products. We always like to hear customer feedback! Your quite welcome. 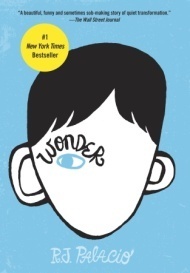 It’s an excellent product and I hope the review helps others in their decision making.